Posted 12/7/2017 11:35am by Cherry Valley Organics. The next time you apply lip balm, take a look at the label. Do you see a list of ingredients? What's on that list? Sadly, most popular brands of lip balm found at the pharmacy or cosmetics counter, contain a whole host of synthetic chemicals mixed together in a base of petroleum. Yep, that's right. Petroleum. They probably also contain various artificial preservatives, flavors, and colors, some of which are suspected carcinogens. That pink, fruit-flavored chapstick you're using isn't made with fruit at all. Instead, it's colored and flavored with synthetic chemicals. Why use natural lip balm? With the rising interest in organic food, it's hard to believe that so many consumers still use soaps, lotions, cosmetics, and other body care products made with synthetic chemicals. Since lip balm often finds its way inside your body when you eat or lick your lips, using natural lip balm is a major step in the right direction. Organic chapsticks, including all of our handmade Cherry Valley Organics lip balms, are made only with all-natural, food-grade ingredients. In fact, high-quality organic lip balms like ours are so safe you could eat them! What's in natural lip balm? 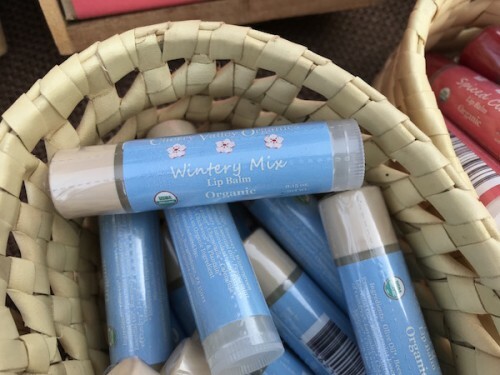 Instead of using a base of petroleum, organic chapsticks like ours are made from beeswax and olive oil. 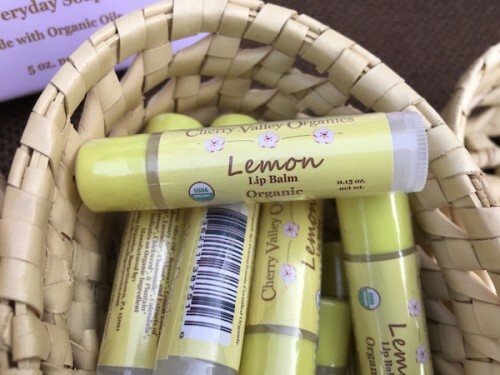 But, unlike other natural lip balms, here at Cherry Valley Organics we worked hard to formulate the perfect balance of beeswax and olive oil to ensure our certified organic lip balms have staying power. Each application lasts a long time, but unlike some other natural lip balm brands, ours isn't sticky. While other natural brands of lip balm use coconut, almond, or jojoba oil in their recipes, we find that olive oil is a far safer option, especially with a surprising number of people being allergic to nuts. Plus, when combined with skin-healing herbs, such as comfrey, calendula, chamomile, and lavender, an olive oil and beeswax base does an exceptional job of healing and smoothing dried, cracked lips. How are natural lip balms flavored and scented? 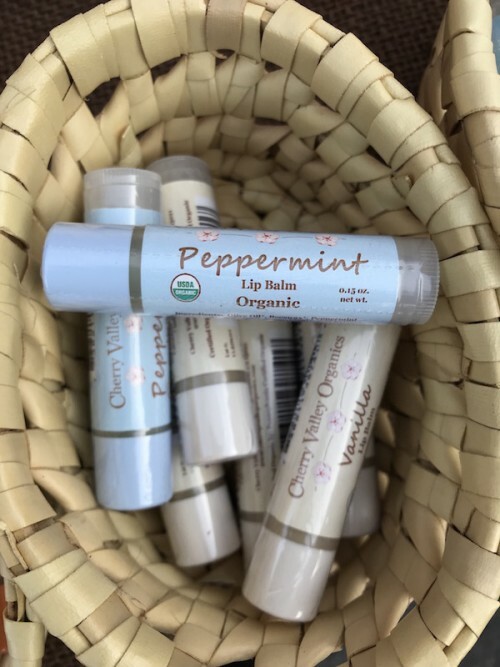 Instead of turning to synthetic chemicals to add flavor and scent to natural, handmade chapsticks like ours, organic essential oils and organic flavor oils are used to infuse the lip balm with a great taste and scent. 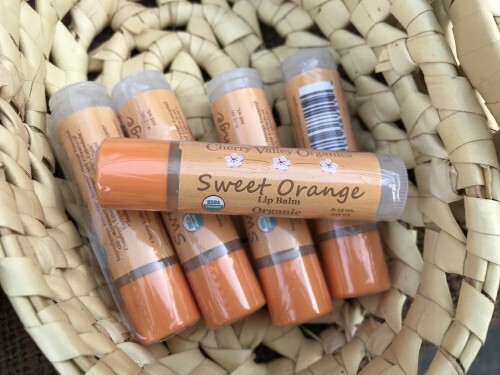 Whether it's Sweet Orange, Peppermint, Lemon, or Spiced Cider, the special combination of ingredients we blend together makes ours the best organic chapstick you'll ever use. Are organic lip balms tested on animals? Cherry Valley Organics never tests our lip balms or any of our small-batch body care products on animals, and we never will. And, as an added bonus, our lip balm tubes are made with at least 30% post-consumer recycled plastic, and they're recyclable. We take great pride in listing every ingredient on our product labels so you know exactly what you're putting on your body. If you have any questions about any of the items you find on our ingredient lists, feel free to contact us. We're always happy to explain how our products are made and why we choose the ingredients we do. 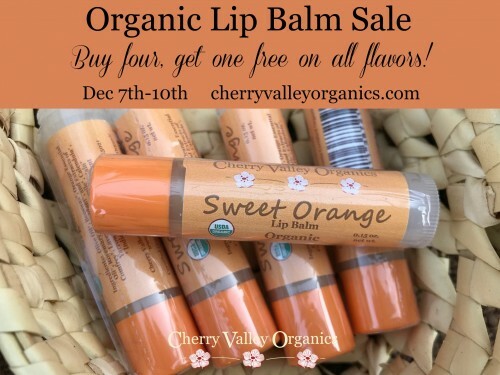 Made by hand in small batches, all of our Cherry Valley Organics lip balms, soaps, and salves are safe and all-natural, and we're confident you'll love them just as much as we do! 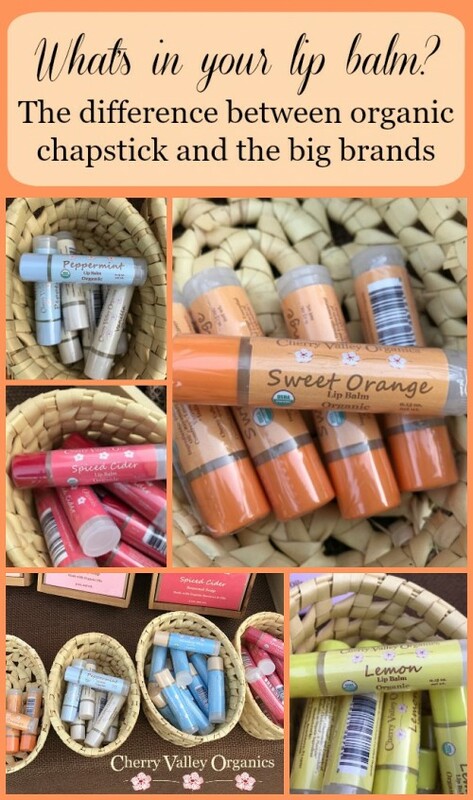 To see a full list of our all-natural, organic lip balms and glosses, click here. *** SALE ALERT! *** Our full line of organic lip balms and other body care products are on sale from February 1st thru the 14th! 20% off all orders with promo code HEART20 at checkout. Click here to take advantage of this limited offer.